In Singapore, hawker Western food is usually deep-fried meat with some oily fries and a teaspoon of cold baked beans, so it's always pleasant to find Western food in coffee shops and hawker centres that are a cut above the rest. In my housing estate, there is a new Western stall called Western Chow, which is very decent. Our coffee shop tended to suffer from poor human traffic because the genius planners tucked it away at a block so far from the main road, you had to live in my cluster of flats to know it's there. And stall turnover was high. So it's great to see some good fare in our humble coffee shop. 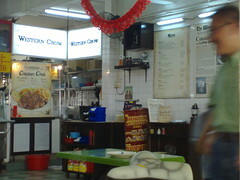 Western Chow serves dishes like chicken chop with mushroom, brown or black pepper sauce, Hainanese curry chicken cutlet, NZ ribeye and sirloin, ox-tail stew, Hainanese beef stew, Dory fish with herbs, Dory fish in bread crumbs, Hainanese breaded pork chop, and grilled pork chop. Sides include mushroom soup and hand-mashed potato salad with ham. I've tried the chicken chops, Hainanese beef stew and Dory fish in herbs. All very nice. The beef in the stew was tender and juicy. I also enjoyed their hand-mashed potato salad. So much better than the powder formula mashed potatoes we eat so often. Prices average around $6 for the mains, and $2.50 for the soup and sides. Steaks cost a little more. The stall opens at around 11am, so you won't be able to do breakfast here. It's located at Block 134 Lorong Ah Soo, next to Paya Lebar MGS. The Hainanese style western food is something I grew up eating, and to find it at my doorstep at reasonable prices, is cool. Do not ever approach the pharmacy counter at Watson's thinking it's a cashier counter. The pharmacist there takes a dim view of your mistake and will curtly tell you that the cashier counter is behind you. Then when you politely tell her it was rather rude of her, she will say she thought from your appearance, that you are an intelligent person and can read the giant sign hanging high above her esteemed counter that said "Pharmacy". In other words, she is implying you were blind and stupid for not being able to tell that her holy pharmacy counter is not the cashier's. According to her, people mistaking her pharmacy counter as the cashier's happens a lot. But she tells you it's the first time anyone told her she was rude. It's a pity. The cashiers at the actual cashier's counter were extremely polite and professional, and even apologised when I told them their pharmacist was rude. I told them it was not their fault, and that their service was exemplary. Watson's just needs to train their pharmacists to be as polite as their counter staff. When I used to work in retail, people always mistook the info counter for the cashier counter. But we were all trained to tell customers nicely, with a smile, where the actual cashier's counter was. And never to make a customer feel stupid for making the mistake or to use sarcasm when the customer complained of poor service. I suggest you try it and see. Go to Watson's Tampines Mall and mistake the Pharmacy counter for the cashier's. Maybe I'm the only one who got dissed. Or maybe you'll get the same treatment. If you get the same curt treatment, let her know. So I won't be the only person to tell her so. Reader Ivan sent me this clip of Kevin Rudd, would-be prime minister of Australia, at Question Time in Parliament, trying to hear better. Mr Rudd is the chap with the blonde hair in the background. If only our parliament were this entertaining. We only have sleeping MPs in ours. After my blog was blocked by Ministry of Education servers in 2004 (due to a filter software setting, I am told), it looks like my little site is blocked again. "You are accessing a site that appears to contain undesirable contents. If you feel that the site should not be blocked OR you are doing legitimate research, please ask your tutors to submit a request for the site to be unblocked." It is a Sonic Wall url, which I assume is some outsourced filtering service the school uses. Wah, a proud moment for me. Banned (again) leh! 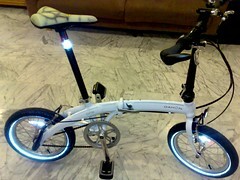 This is my Dahon Curve D3 with new upgrades. The upper part of the bike is pretty much all new parts. My foldie now sports a Pazzaz carbon seat post, Rido Glow-in-the-dark saddle, Radius VRO handle post, Syntace VRO clamps, AL carbon handle bar, and Ergon R2M magnesium grips. The ride is different with the new parts. The handle post is stiffer and the bike now handles better. The parts also make the bike lighter. The new handle post folds outwards though, but it is no big deal. I love the new grips too. Behold, my Dahon Curve D3 "Z"
"Z" is for Zhnged, hahaha! 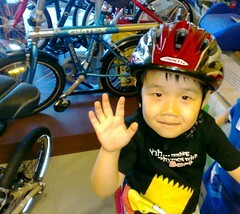 I spent a very pleasant afternoon with Isaac on Saturday at the bike shop. Mommy was tired after the morning outing with Joy (we went to a neighbour's wedding lunch) so I volunteered to get Isaac out of her hair for the afternoon. We dropped by Speedmatrix to pick up an El Boso carrying bag for my Dahon Curve and a Bellinni child's seat for my mountain bike so that I could take the kids for rides. I also wanted to have my wheels looked at because some bits were bulging. Isaac was thrilled to see so many bikes and helmets on display. I got him a helmet his size because I planned to take him on my bike with the new bike seat, and he wore his helmet the whole time, refusing to take it off even during dinner. It was fun to hang with him and doing guy things together. Usually, when we are out as a family, he tends to get a little whiny. But with me alone, he was fine. I suspect when he is with his siblings, there is a feeling of competition and insecurity for our attention. My only regret was not bringing his kid's bike along. The nearby playground in the private housing estate would have been ideal for him to cycle around, and a nice change from the concrete world of our HDB flat. Blog Action Day: Cycle (safely) instead of driving! I am a little late for Blog Action Day, but better late than never. I thought I'd share about saving the environment by cycling instead of driving. This bicycle safety video was done by the San Francisco Police Department and the SF Bicycle Coalition, to help make SF cops more aware of a cyclist's rights and responsibilities. Note that while the laws cited in the video apply to San Francisco and not to Singapore, the safety issues mentioned are very relevant to cycling here. And also note that they drive on the right side of the road while we drive on the left. So if you see me riding in the middle of the left-most lane where there are cars parked along the left side of the street, you now understand why. Getting "doored" by a parked car is bloody dangerous for a cyclist. It was also cool to see the kinds of roads and legal protection they set up for cyclists there. Also interesting, this piece by Brian Sorrell entitled: Bicycling Is Not Dangerous: What I've Learned As A Bicycle Commuter. In this article, he debunks some of the myths surrounding commuting by bike. When I tell people that I ride a bicycle to work, many suggest that bicycling is dangerous. Riding on the wrong side of the street, on sidewalks, weaving in and out of cars, chatting on the cell phone: these activities make bicycling appear dangerous. Just as you would not expect a safe car ride on the sidewalk, or against traffic, or while chatting on the phone, you should not expect a safe bicycle ride under similar conditions. I was having a chat with Marc and Ivan the other day about the state of classifieds and how people are changing the way they buy and sell stuff. The interesting thing is that many of us are now buying and selling things on online classified sites like Craigslist Singapore, or in forums where people who share an interest congregate, like Togoparts for bicycles, and Clubsnap for photography. I remember the old days, where you had to pay $27 for a three-line listing in the papers to sell things. Then Pacific Internet came along, as a pioneer in online classifieds and things changed dramatically (until they decided to charge for it, then people fled in droves to find alternatives). Since then, you can find online marketplaces for everything you need, from hobbies, to cars, to property, to jobs. I suspect the move away from print classifieds is not just because of fees, or the ease of digital searches, but largely because of communities. You know that if you hang out at a site or forum where, for example, bike lovers congregate, you are more likely to get the right audience to sell your bicycle stuff to, and the right people to buy from too. Newspapers do have their own online offerings with fancy features, but people continue to buy from their favourite forums or online-only sites. You can offer nifty features like uploading videos, photos and the like but you cannot duplicate the communities set up at those forums, which is what makes them powerful marketplaces. "We’ve been hearing increasingly from newspaper reporters who confide that they are only allowed to write negative stories about Craigslist these days, because we’re viewed as competition by their newspaper’s business managers." If the Rebellion had beauty pageant contestant, Stacy Hedger, playing her trumpet for them, the Death Star would have been destroyed without even needing to send Luke down the trenches. I think when she was done, not only did she take down the Death Star, Alderaan blew up too. Check out the sympathy applause during her Charlie Chaplin bit. She really takes it to a new level with those moves. This video has everything, man. A blonde beauty contestant, black tights with glittery sleeves, Star Wars, shooting, ducking, trumpet as blaster... epic stuff. "Always two there are; no more, no less: a master and her trumpet." Death needs a location! Find out how Singapore deals with it at mrbrownshow.com! Report for your open mob at mrbrownshow.com! Malaysia has to deal with some killer seafood at mrbrownshow.com! Our best weapon is not what you think it is! PM say one! Find out at mrbrownshow.com! the mrbrown show: pay cut also must dry run! Singapore is always prepared! Go and participate in the drill at mrbrownshow.com! ASEAN shows its strength in dealing with errant member nations! Find out at mrbrownshow.com! Update: In a confidential email to EMI employees, Guy Hands, whose private equity house Terra Firma purchased EMI two months ago, said the dramatic move by Radiohead was "a wake-up call which we should all welcome and respond to with creativity and energy". Yahoo Music's general manager Ian Rogers tells label execs to do away with DRM and make it easy for users to get what they want. "Want radio? No problem. Click play, get radio. Want video? Awesome. Click play, get video. Want a track on-demand? Oh have we got a deal for you! If you're on Windows XP or Vista, and you're in North America, just download this 20MB application, go through these seven install screens, reboot your computer, go through these five setup screens, these six credit card screens, give us $160 dollars and POW! Now you can hear that song you wanted to hear—if you're still with us." He also says that Yahoo will no longer sign with labels that place barriers between their music and their customers. Good on you, Yahoo. 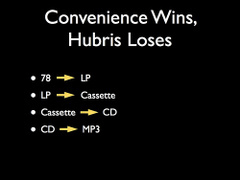 Read the rest of his presentation. Bitter also must swallow it! Get your meds at mrbrownshow.com!